The DISC SmartPack™ contains an electronic identifier so that the storage management software can track the SmartPack™. This allows an effective offline media strategy such that if information is requested that is on a piece of media outside the library, the Administrator can be informed which SmartPack™ to reinsert to access the information. Upon reinsertion the SmartPack™ is recognised and the data quickly retrieved. Unlimited virtual capacity is offered through the efficient handling of the libraries off-line media storage capcity. 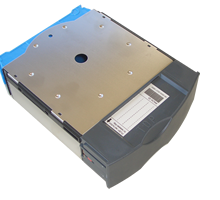 DISC can supply SmartPacks™ filled with blank media or empty to support your media handling needs. The SmartPack™ Removable Media Technology offers simple and secure long-term archiving of optical media.